Yamaha has issued a recall on a coolant line on your bike. It is recommended you don’t ride your bike until the recall has been completed, as leaking coolant can cause a slippery condition and cause you to loose control. I have ordered the necessary part and will contact you when it comes in. You will receive a confirmation of this from Yamaha in the mail shortly. My R3 is a 2017 model year. The email does not specify what model years or serial number ranges are involved. Note the recommendation to stop riding until the line is replaced. How does that work with a track bike? Should I take the race body off and pretend it’s still street legal? Will the dealer do the recall for me? Last edited by JimGnitecki; 12-07-2018 at 11:38 PM. Yeah, but now after reading the 2 articles, I THINK I see what the problem APPARENTLY actually is: an improperly manufactured or improperly installed hose clamp. I mean, what ELSE could a "torsion spring" capable of causing a leak in the cooling system be?? Unless it's a really rotten translation of "thermostat' (which does have a spring within it)? IF it is actually an unreliable thermostat, that's worse, since it could cut off coolant flow from the engine to the radiator entirely, and then when the coolant gets hot enough, you get lots of engine damage AND a really BIG sudden coolant leak. But, I have no reason to think "thermostat" unless we assume that "torsion spring" refers to the thermostat spring. This vagueness COULD simply be a result of the fact that it is Yamaha INDIA that identified the issue, and someone may have done a really crappy translation from Indian to English. The vagueness of the wording, and the instruction to stop riding the bike until it is repaired by a dealer, also SUGGEST to me that Yamaha is afraid if they just identify the problem part, some owners will try to fix it themselves (because it's easier and faster than going through the dealership process), and then if they don't actually do it, or do it improperly, there's a contingent safety liability for Yamaha out there for the life of the bike. That's not what the company attorneys would like. 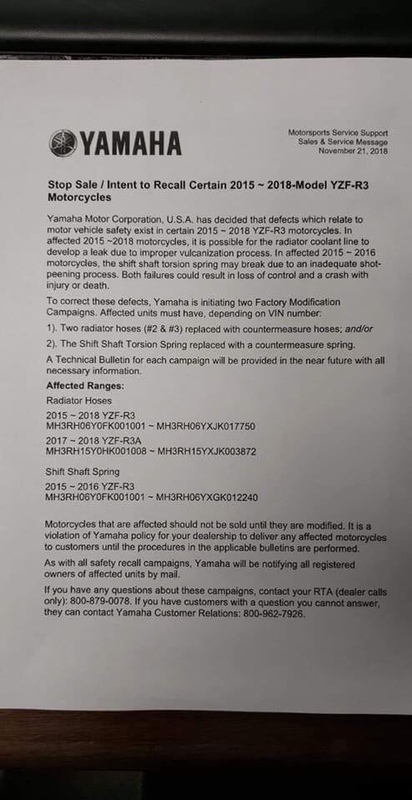 Since the fix is apparently easy and cheap, it makes sense for Yamaha to insist on a dealer repair, so that they have documented proof that the safety issue was remediated. Why the big safety concern? because engine coolant is one of the slipplier substances known to man. if any of it gets on a rear tire, you have an instant big league traction and staying-upright problem. Couple that risk with the demographics of the target owners, young inexperienced riders, and the potential for calamity goes up. At least the above this is what I think right now based on the very limited information so far. Be sure to note the manufacturing date range involved as well. Only SOME R3s are involved. "This voluntary recall is being undertaken to address an issue related to the leaking of coolant from the radiator and widening of torsion spring"
"widening of the torsion spring" probably means "stretching" of the hose clamp. BUT, do NOT assume I am correct in thinking this.It's just one possibility, and statistically the most likely. "1,874 units of the motorcycle are being recalled globally to fix an issue that caused coolant to leak from the radiator, which was caused by a defective radiator hose. The company will also replace the spring torsion component." Note the "caused by" and then the "also" that I highlighted via red font. So, hose AND hose clamp will be replaced? Last edited by JimGnitecki; 12-08-2018 at 12:09 AM. Well you pretty much made my point for me. It’s a shift shaft spring. Wow! This is really TWO DIFFERENT defects, entirely UNRELATED, for DIFFERENT MODEL YEARS, and Yamaha has COMBINED them??? The coolant hoses are obviously between the radiator and the engine. The shift shaft spring is in the gearshifting mechanism in the transmission! There's no way these 2 entirely different defects should have been combined, and calling out the shift shaft spring as a torsion spring in a coolant leak recall obviously suggests a poor translation of "hose clamp" and leads a reader entirely astray. Someone at Yamaha really screwed up. Get the popcorn out for the upcoming Tower of Babel conversations between Yamaha, dealers, and R3 owners. I've just changed the coolant today Even so my VIN number is outside of that range, which is good. Although if it ever happens that my R3 is subject to recall, does anyone have access to the part numbers which must get changed and instructions which are normally shared by Yamaha to the dealers?